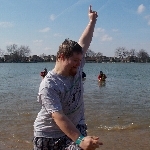 Cindy, Matt, Gerrit and I are once again taking the Polar Plunge in Manteno 3/2/19 to benefit Illinois Special Olympics. As you know Matt has been to many of the Special Olympics State Basketball and Powerlifting Tournaments and the polar Plunge is one of their larger fund raisers. Best of all, your donation helps provide athletes with intellectual disabilities the opportunity to participate in Special Olympics programs and reveal their inner champion. It is for a great cause and you would be surprised how Inspiring/Stimulating that frigid water can be. Otherwise If you can't join us, Any donation would be Greatly Appreciated not only from us but also from the Special Olympics Organization. Thanks in advance for your support – and don't forget to forward this on to anyone you think would like to donate too!